Breakfast Oatmeal Cupcakes – Cook just once, and you get a delicious breakfast for the entire month! I finally went ahead and published a post showing What I Eat In A Day. 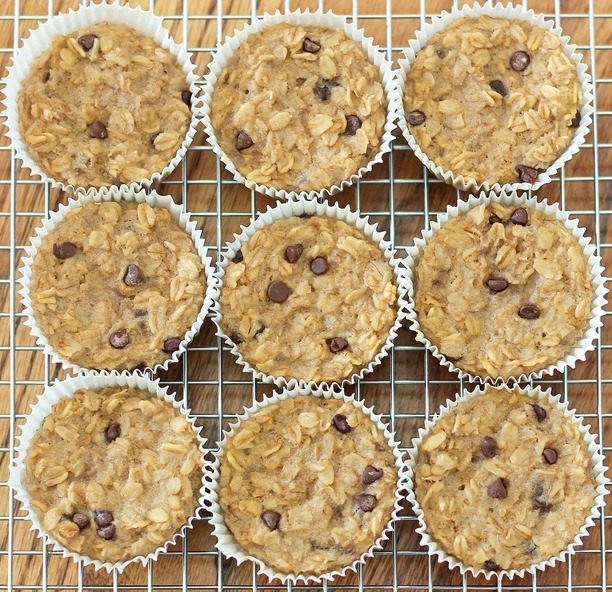 These breakfast oatmeal cupcakes are one of my family’s favorite things to eat on rushed mornings. I first made the recipe years ago, and we still love them! My mom often makes a batch for herself and takes them to work in the morning so she can have a nutritious breakfast that’s easy to prepare on busy weekdays. Easy to eat at a desk… or pack in a lunchbox! Just throw a couple into your bag, perhaps along with a container of peanut butter and some fresh fruit, and you’re good to go with a balanced breakfast. My family, my old roommate, and five of my friends are all hooked! Above is a video of the pumpkin version being made – If you love pumpkin, be sure to check out that flavor too! Cook once, and you don’t have to worry about breakfast for a month! These customizable “breakfast” baked oatmeal cupcakes are great on-the-go fuel for those days when you have zero time in the morning to prepare a big meal. 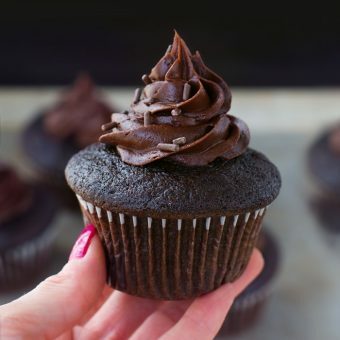 And you can easily change up the flavor by choosing different spices and add-ins for endless breakfast cupcake variations. Do you ever skip breakfast? And what do you usually eat on days when sitting down to breakfast just isn’t an option? When I was a teenager, I hated getting up early, so breakfast was often something portable, eaten in the car as I rushed to school. I never understood how my friends who skipped breakfast could make it through class. The only times I’ve ever really skipped breakfast were weekends when I was 13 or 14… because I’d completely sleep through it! If you make them and post a photo, feel free to tag me on Instagram, @ChocolateCoveredKatie, so I can see and like your pictures! optional add-ins: cinnamon, shredded coconut, chopped walnuts, ground flax or chia, wheat germ, raisins, dried fruit, etc. Preheat oven to 380 F, and line 24-25 cupcake tins. In a large mixing bowl, combine all dry ingredients and stir very well. In a separate bowl, combine and stir all wet ingredients (including banana). 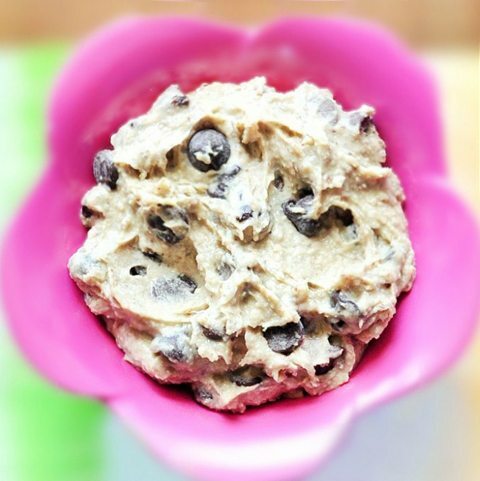 Mix wet into dry, then pour into the cupcake liners and bake 21 minutes. I also like to then broil for 1-2 minutes, but it’s optional. (If you let them cool overnight, they’ll no longer stick to the liners.) 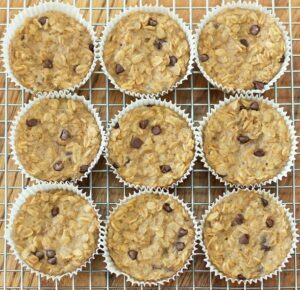 These oatmeal cakes can be eaten right away, or they can be frozen and reheated for an instant breakfast on a busy day. Your photography is amazing Katie! Simple is definitely better when it comes to taking pictures. I love that first one where you can see all of the chocolate chips. I agree! If I don’t eat almost immediately after waking up I turn into a grumpy monster. 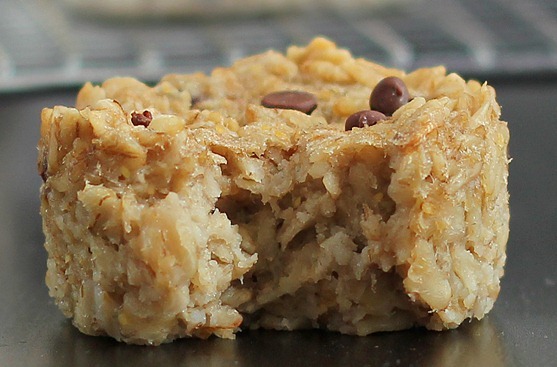 Oatmeal is my favorite breakfast so I can’t wait to try these! I must eat within an hour of waking up!! I can’t wait to try these. I’m wondering how much “regular” sugar you would use?? Any ideas? Thanks in advance! I want to make these. I use Stevia from Trader Joe’s which is rated the BEST! I swear I’m hooked. I’m not sure how much to use however. Gotta find out. 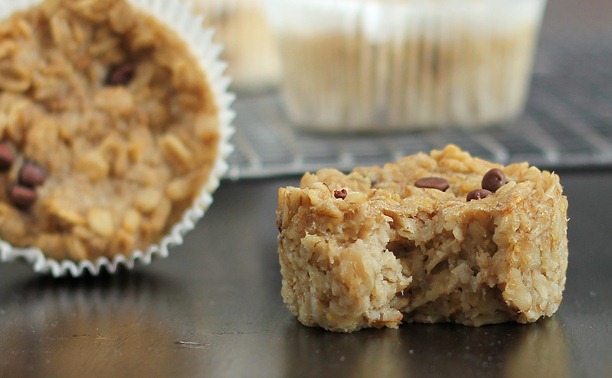 These oatmeal cupcakes look delish! 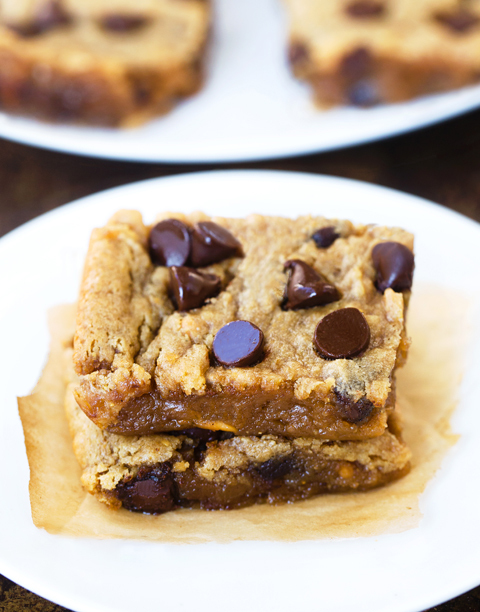 I used about 5 tablespoons of brown sugar and they turned out super delicious. I did a little research, if calculations are correct, 5 packets of the sweetener is equivalent to 1/4 of plan sugar. I’m also using quick oats. I just put a batch in the oven with that substitution. I’ll let you know how it turns out. How did it go with the quick oats? I am about to make these and that’s all I have! I hope they were good! I was wondering the same thing…I want to use quick oats too. I used oatmeal (quickoats) and it was delicious!! Quick oats work perfectly fine. Stivia and sugar are substituted equally. Stevia is so much sweeter than sugar a direct substitution is not possible you need to research how much to use. 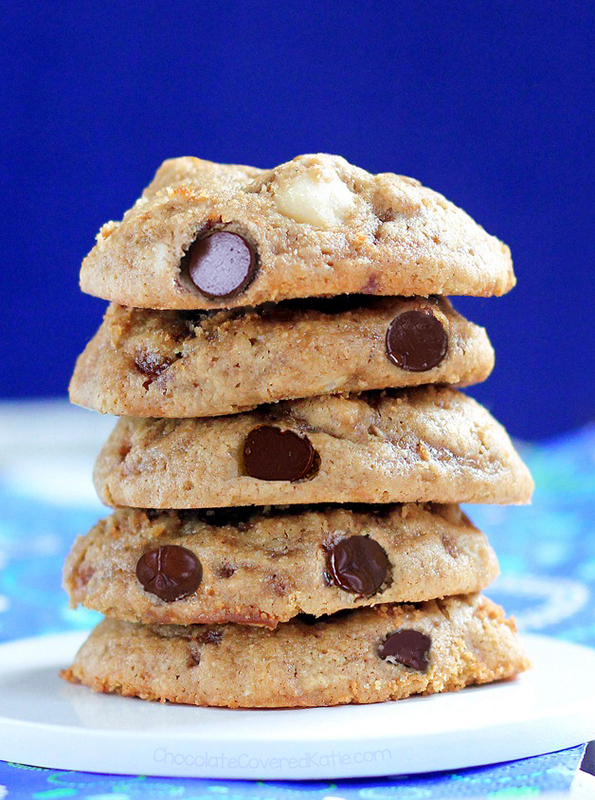 also drink 2 cups of water early morning and with these cookies to aid digestion. Water from the tap is soooo important. This sounds convenient and delicious. Will make it and leave feed back (if I don’t forget). Define “breakfast”……I eat around 10:30 or 11am usually. Can’t really stomach anything much earlier than that. If you can get something gentle in your tummy, even a handful of nuts for protein, it will really make a difference in your day! 🙂 Whole grains are really good too which is why I love Katie’s idea! Sounds delish! I eat within 1/2 hour of getting up. I also drink about 12 oz of water during the night. Have a glass of water on my nightstand every night. And yes I do go to the bathroom a lot. This recipe sounds great!!! I dont eat until around 1pm most days and I get up on school days at 6:30. Not everyone is a breakfast person. I just cant stomach it. Haha I NEVER skip breakfast! This is a great idea, and so cute! Smartie!!! What a great idea! I would have never thought of this in a million years – thank you for saving me a lifetime (or two! LOL)! I’m in a freezer group and I was assigned breakfast this month. I happened to come across this recipe and had the basic ingredients. Oats, honey, applesauce, flax seed, walnuts and cranberries. I love bananas but I did not use them. I’m so glad you mentioned they freeze well, because that’s the goal of our group…easy, quick foods. Holy crap these look *so* fun! I cannot wait to make them!!!!! 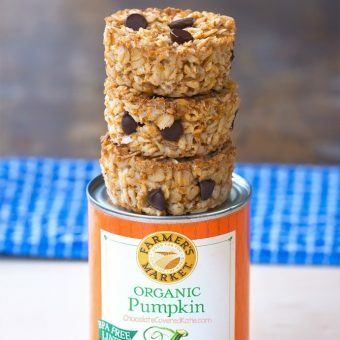 I don’t eat a lot of oatmeal but these look really good and my brother has been in a muffin mood lately. Plus growing boys always need snacks LOL. Oh my gosh, thank you so much for this recipe. I’ve been needing to create an “easy” go-to breakfast meal on the 3 days a week I work. This is perfect! I always eat breakfast. I find that even if I’m not hungry when I wake up (which I usually am), if I don’t eat I will be RAVENOUS 1-2 hours later. These look great and super easy! I could never skip breakfast. I’m always hungry in the morning, and it sets a healthy tone for the rest of my day. These look great as a snack! Just wondering about a couple of things – first, since they are meant as a ‘portable breakfast’, how come the recipe is for small cupcakes rather than large muffins? I mean, even with some peanut butter and fruit (as you suggest) you’d need about four of these for a normal breakfast, so it just seems like a decent sized muffin would make more sense. 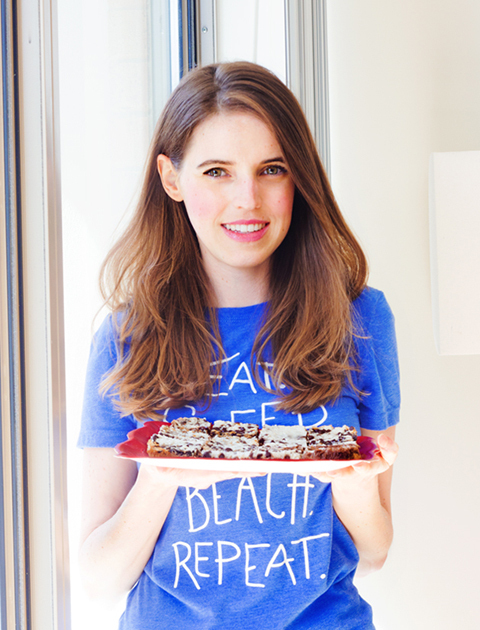 I’m curious about your reason for making them so small – is it to reduce the baking time? Second, I’ve never seen a recipe for cupcakes or muffins before that uses water as the main liquid. Is there a particular reason for this,or had you just run out of milk? Sorry but this sparked my curiosity as a fellow baker… Obviously it’s common to use water for bread baking, but it had never occurred to me that one might do it for sweet baked goods – but now that I’ve seen this I’m wondering how much difference the two liquids make. I assume it would be mostly in terms of flavour? If I’ve understood you correctly from some of your previous posts, you tend to experiment quite a lot with a recipe until it’s perfect, so if the use of water is a deliberate choice, would you mind sharing the secret behind why it’s preferable to milk in this recipe? Thanks in advance, and sorry for the long post and all the questions! That’s just how many the recipe makes. They fill the muffin tins completely, so you couldn’t make them any bigger (unless you owned a jumbo muffin tin). As for the water, the recipe was adapted from my single-serving boatmeals, which use just a little water. I’ve not tried using milk for the recipe, so I can’t tell you the results of that. And as it states in the post (and in the nutrition link), it’s definitely not meant to just have a cupcake and nothing else as breakfast. My roommate brings 2 with her to work, sometimes with an applesauce cup or whatever else she wants. (I never asked what she eats with it at work.) My mom is fine with just two for breakfast. Everyone’s needs are different, and not everyone needs a big breakfast ;). I have found one is a perfect addition to our morning smoothies. My husband packs 2 for breakfast everyday! And my kids love one for a snack after school and in their lunches. As you can guess, I make a batch almost every week! We love them, especially with lots of coconut! hi, i see people saying something about boatmeal recipes?? what is that? Hannah, I am confused about your comment that you’d need to eat four cupcakes for a normal breakfast. Four cupcakes plus the peanut butter and fruit that Katie recommended would be like a 700 calorie breakfast! Unless you are an extreme athlete, I think that is a little big for an everyday breakfast. Actually 700 calories for breakfast is about right. If your eating 2000 calories a day you want the majority of those calories to be between breakfast and lunch with fewer calories at your dinner meal. Due to the fact you will be relaxing and shutting down for sleep shortly after. I would say this amount is for weight-loss, and the average would be more like 1,600 calories…but of course calorie needs will vary from person to person. I agree that everyone’s caloric needs are different. 700 calories of the right calories would not be too many, but that amount of food may be too dense for the average stomach to hold comfortably. I can’t recommend The Calorie Myth book enough for those who are curious about how much they should be consuming. Anonymous: your calculations are a bit skewed. ANY woman should be able to eat far more than 1200 calories without weight gain. If this isn’t true for you, there are larger issues going on with your hormone balance. Refer to the book I mentioned! as a kosher and vegan baker I’ve often substituted water for milk in recipes – never really saw much of a difference although I could imagine that milk would add a higher fat content to the recipe and therefore add some moisture, but I’ve never really been one to have milk in the house so almost any time a recipe calls for milk in the mix I use water – vegan mills are also an alternative if I have them on hand. Katie, thanks for your reply. Anonymous, I think you’ll find that most professional (if that’s what you mean by “extreme”) athletes need to eat far more than that to sustain their training. Personally I’m not an athlete, in fact I do barely any exercise at all, and I have around 500-600 calories for breakfast, sometimes more. Ilana, that’s interesting to know, thank you! I am curious as to what you eat the rest of the day. I am 5’4″, 37 yrs old and weigh about 130 and am hardly active at all. The MAX calories per day I can eat and not continuously gain weight is about 1500-1600. Their are BMR calculations you can do. The amount it “costs” me just to run my body systems is 1347.4 and for little to no exercise to MAINTAIN my weight is MAX 1616 calories. 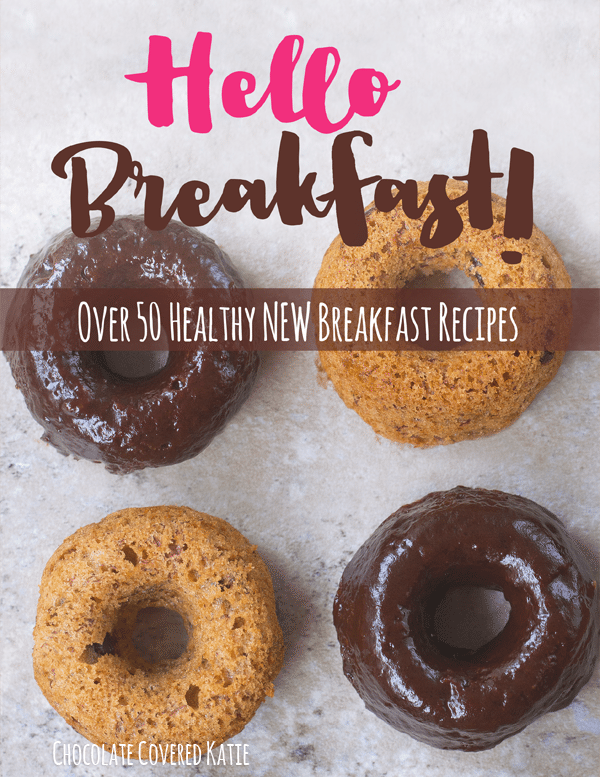 I have been skipping breakfast to save calories so I am trying to figure out how others do it. How do you eat a breakfast that big with little exercise and maintain a healthy weight… do you eat smaller meals later, no snacks, advice is appreciated? Thanks! It is easily done if your calories do not come from refined carbs. I’m 5’5 and 120 pounds, and I eat at least 700 kcal at breakfast. I think my average daily intake is about 2200~2500 kcal. I’ve been eating this way for about 8 months and haven’t gained any weight (and I don’t exercise a lot, I mean, I ride my bike every once in a while and do yoga two times a week). So that means that if you’re eating the right foods (high carb, low fat, no oil, minimum refined foods), you can eat however much you want without gaining any weight. There’s no need to count calories (we’re the only animals doing that, right?). I hope you read this comment and start searching and investigating about what I just wrote. I’ve used almond milk in a similar recipe, it tasted great. Hannah, are you thinking those are mini-cupcakes? I think they are made in a regular sized muffin pan. One thing that perhaps Jaime doesn’t realize is that these “cupcakes” are very dense. There is no egg and no leavening agent (baking powder or soda) in them, so they don’t have a cake/cupcake/bread texture. They’re like hockey pucks. That’s not to put them down, but just a couple is a lot when you’re talking about pretty much solid oatmeal. Remember, there are FIVE cups of oatmeal in this recipe to make just 24 cupcakes. That’s a lot. As for my own experience making these, I just made them with bananas and golden raisins. They’re pretty darned good. I used three tablespoons of brown sugar for sweetening. Another thing — I made half in paper baking cups and half in foil cups. They’re sticking to the paper cups like a bugger, but they don’t stick at all to the foil ones. Very good recipe — thanks. Hannah, think of them as a breakfast granola cake instead of a ‘muffin’. This is such a perfect idea! I’ve been so busy lately just running around all over the place and it can be hard to make sure that I’m eating healthy, energizing foods that are easy to eat on the go. I’ve been doing a lot of containers with beans, quinoa, and veggies, but that requires utensils and a steady place to sit and eat. 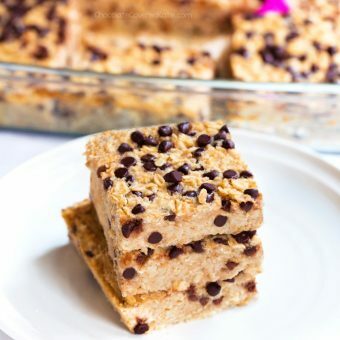 I get tired of granola bars, so this homemade option looks so fresh and yummy! love this idea! do you think they would still taste good if you freeze them? I have made a similar version of these and froze them. I throw them in the oven to thaw them out and get them good and hot (I try not to use my microwave very often), and they are just as delicious as the day I made them. Enjoy! Looks great! I am a lover of gooey things, like fresh oatmeal. 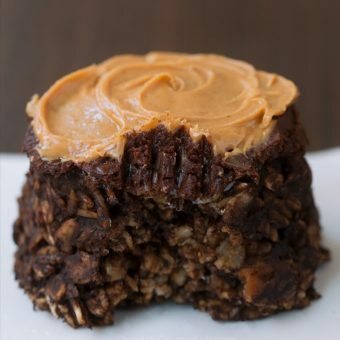 I believe that you share my love of gooey vs dry foods, and I was just wondering if these were something that you liked personally or they have just been popular with others? Or do the gooey tastebuds prefer regular oatmeal? These would be great for convenience sake, I’m just not sure that I would like them baked vs regular! I think they are good (or I wouldn’t have posted the recipe lol). But I don’t eat them for breakfast often. I like bigger breakfasts and don’t really have a need for anything portable. Haha- I just know that sometimes you post things that readers will like, though they may not personally be your favorite is all 🙂 Thanks! I was just thinking last night that I need soemthing on the go for the busy mornings! This is perfect. I’m been searching for about a week now on this same thing. I’m denfinely going to try yours but I’m a little confuzed but another post. Do you put them in mini cupcake liner or regular size? i don’t think i’ve met any school age kid who eats breakfast. maybe i just do because i’m so voracious in the morning. i do a little exercise, and after going nearly 8 hours without anything, i guess its a little normal to want some food. i think breakfast is important because it’ll turn off crazy cravings for a while, and it keeps the metabolism up, which is why i cringe when i hear so many teens don’t do it. I struggle a lot when it comes to breakfast and always look for grab and go breakfast. Thanks Katie 🙂 your recipes are always so spot on. Will certainly give this a try.